Happy New Year! 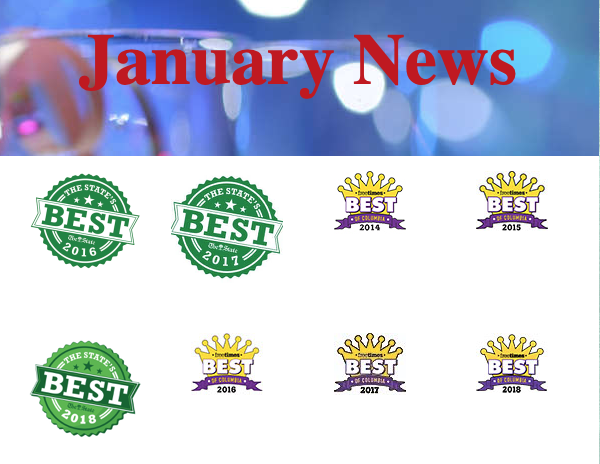 Welcome to our January newsletter. Second Recital Weekend at Columbia College! Another great weekend for music at our Second Recital Weekend at Columbia College in December! Job well done and congratulations to ALL of our Performers! Stay Tuned for Dates for our Spring Recitals! BIG NEWS: School director Marty Fort’s new book “The Ultimate Guide to Music Lessons” hit NUMBER ONE on the Amazon New Release Best Seller chart, even topping Alice Cooper’s new book! Pictured Right: Drum Student Donnie earned both his Prodigy (Two Year) and his Master (Three Year) Trophies! Welcome to the New Students Who Enrolled in December! Irmo Music Academy Enrolls over 150 Students! We’d like to give out a SHOUT OUT to the staff, teachers and students at the Irmo Music Academy. We’ve enrolled over 150 students in less than four months! Thank YOU Midlands for making us SC’s largest and fastest growing music school. To Celebrate, we raffled off a $150 Amazon Gift Card! Check out our Facebook page to see if you've won! ‍Many teachers have sold out. If you need a schedule change or would like to be added to a waiting list for a particular teacher, day or time, please contact any of our office staff team and they can add you to the waiting list. Chance G. - Mondays: ONE SPOT LEFT. Tuesdays: SOLD OUT. Christian S. - Fridays: SOLD OUT. Emily R. Thursdays: SOLD OUT. Lewis T. - Tuesdays: SOLD OUT. Mark V. - Wednesdays: ONE ﻿SPOT LEFT. Mike R. - Wednesdays: ONE ﻿﻿SPOT LEFT. Jason S. - Mondays: ONE SPOT LEFT. Tuesdays: ONE SPOT LEFT. Evan S. - Monday afternoons: ONE SPOT LEFT. Tuesday afternoons: ONE SPOT LEFT. Will A. - Sundays: ONE SPOT LEFT. Dante T. - Tuesdays: SOLD OUT. Thursdays: ONE SPOT LEFT. Desiree R. - Wednesdays & Thursdays: SOLD OUT. Jolene F. - ALL TIMES SOLD OUT. Lisa C. - Wednesdays: ONE SPOT LEFT. Fridays: SOLD OUT. Tina M. - Sundays: ONE SPOT LEFT. Tuesdays: ONE SPOT LEFT. Nikea R. - Tuesdays & Fridays: SOLD OUT. Wednesdays: ONE SPOT LEFT. Mark V. - Monday afternoons: ONE SPOT LEFT. Every time you refer a new student - You will get your choice of an Amazon, Target, or Movie Pass Gift Card!